From his stunning discovery of Tyrannosaurus rex one hundred years ago to the dozens of other important new dinosaur species he found, Barnum Brown led a remarkable life (1873–1963), spending most of it searching for fossils—and sometimes oil—in every corner of the globe. One of the most famous scientists in the world during the middle of the twentieth century, Brown—who lived fast, dressed to the nines, gambled, drank, smoked, and was known as a ladies’ man—became as legendary as the dinosaurs he uncovered. Barnum Brown brushes off the loose sediment to reveal the man behind the legend. Drawing on Brown’s field correspondence and unpublished notes, and on the writings of his daughter and his two wives, it discloses for the first time details about his life and travels—from his youth on the western frontier to his spying for the U.S. government under cover of his expeditions. 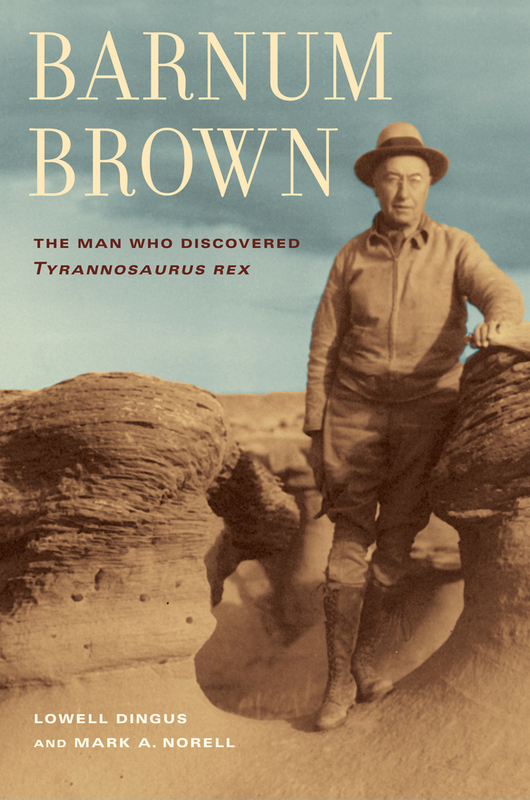 This absorbing biography also takes full measure of Brown’s extensive scientific accomplishments, making it the definitive account of the life and times of a singular man and a superlative fossil hunter. Lowell Dingus is Research Associate in Vertebrate Paleontology at the American Museum of Natural History in New York and the Natural History Museum of Los Angeles County. Mark A. Norell is Chair of Paleontology at the American Museum of Natural History. Together with Eugene Gaffney, Dingus and Norell coauthored Discovering Dinosaurs: Evolution, Extinction, and the Lessons of Prehistory (UC Press, winner of an American Library Association Award).